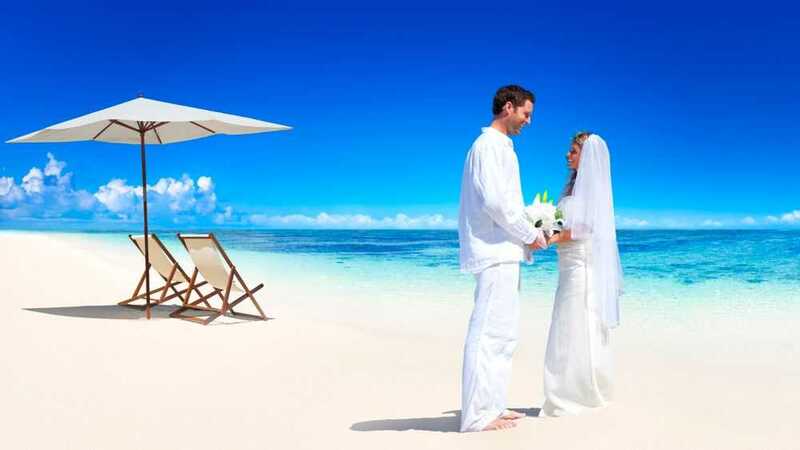 So you and your significant other have decided on a beach wedding. And while some may consider the bride’s dress the biggest decision in the clothing department, that’s really not the case. All eyes will be on the groom, too. So you want to dress to impress. But you need it to be appropriate to your theme and venue. What type of clothing should the groom go with? There isn’t one answer to that because it depends on a variety of factors. But keep reading to find out your options, and how to choose the best outfit for your big day. If you’re the groom at the wedding, your clothing options should be simple, right? That may be true if you are doing everything traditional and formal. But throw a beach wedding into the mix and things get a little complicated. You see, you don’t want to clash with your own wedding. And you also don’t want to be miserable as you stand there and say your vows. In addition, you want your clothing to represent you. Just as a bride’s dress represents her individual beauty and uniqueness. Location makes a difference when you plan out your wedding attire. It’s at the beach, you say? Yes, but at which beach and what part of the world? This makes a difference for a variety of reasons. Have you ever gone to a beach and it was so cold you need a jacket? Or maybe it was so humid that your swim trunks did nothing to keep the heat away? Different beach locations may have different climates. So you have to keep the temperature in mind. In addition, the temperature for your outdoor wedding may vary depending on what season you hold your ceremony in. When you think of “location” with respect to picking out your wedding clothes, you may also have to take into account where in the world the ceremony will be. They aren’t uncommon. 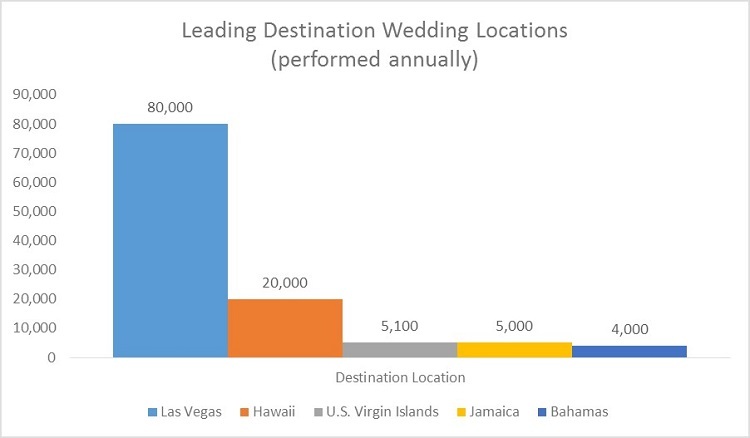 And four of the leading locations for destination weddings are places famous for their beaches. Yet, every beach location isn’t the same. You may have mild weather in Hawaii, but if you plan on going to the Bahamas you may have to account for humidity. Can you have a formal wedding on a beach? Absolutely. But the level of formality may vary depending on your chosen wedding theme as well as the temperature. 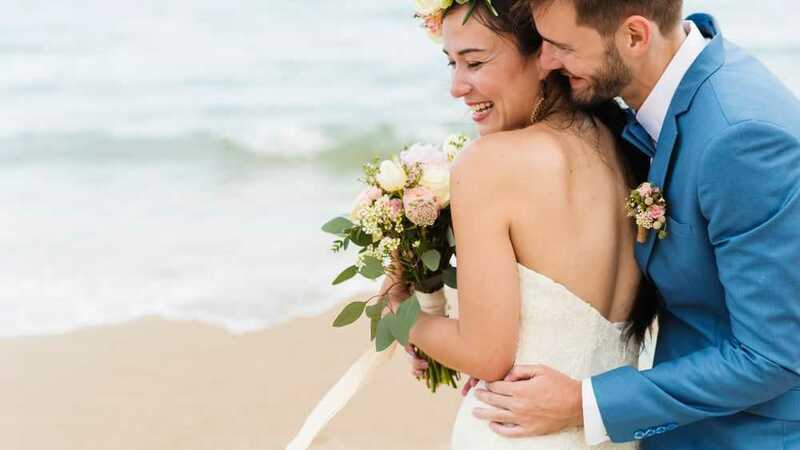 While a tuxedo may be perfectly acceptable for an indoor wedding, you may have to change the pieces of your attire to suit a beach atmosphere. For example, using light colors such as cream or shale instead of classic black may help keep you cool during the day. Or exchanging heavy fabrics for lighter, breathable ones like linen may be a good compromise, should you or your spouse-to-be prefer the look of a formal ensemble. 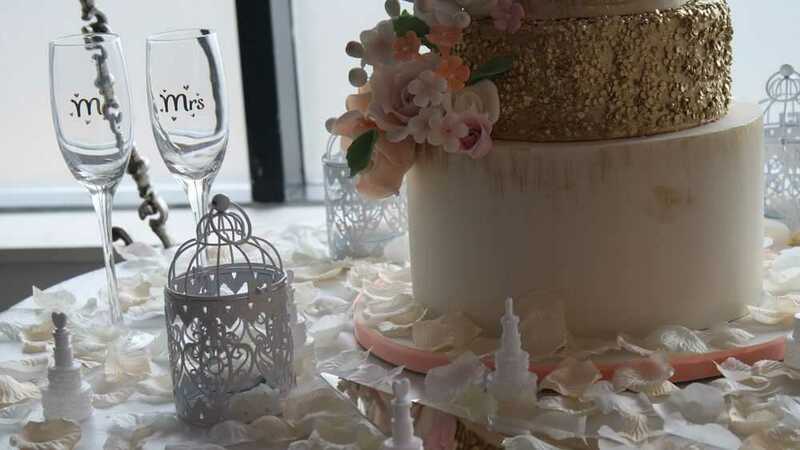 However, if you and your partner have decided on an informal wedding, you may have more options. A classic white linen shirt paired with a pair of nice trousers may be all you need on your special day. For an informal wedding, you can leave the tie at home. And for added comfort, think about unbuttoning the top button of your shirt. Do you have to match your future spouse? Not necessarily. Unlike your high school prom, you don’t have to add elements of your wedding color into your clothing if you don’t want to. Your wedding attire should reflect your personality, but you might want to coordinate with your partner. So, if she is going to brave the beach in formal attire, you shouldn’t show up in jeans and a t-shirt. One option is a cream or shale colored suit that can be dressed up or down depending on your wedding atmosphere. Furthermore, try to complement your partner’s attire. She may be the shining star, but you’re important too. So, pick clothing that goes with hers. If she decides that a sundress suits her perfectly, you wouldn’t be out of line wearing khakis and a button-down shirt. Wedding themes and colors can also play a part in picking out what to wear as a groom. You may want to incorporate elements of your wedding color into your groom ensemble. But avoid the monochromatic look of dark colors unless your wedding is in the evening. Lately, wedding color trends look like they veer towards neutrals. But the various shades of blues still remain popular. Dark blue or navy can make a beach affair seem more formal. However, if your wedding is during the daytime, light blues may be more appropriate. And the lighter color may keep you cooler during the ceremony. Traditionally, the groom and groomsmen incorporate wedding colors into their accessories to tie the wedding party together. You can still do this for a beach wedding. But your options may be limited if you are eschewing a tie or jacket. You may be surprised to know that a beach wedding gives much more clothing freedom than traditional church weddings. You don’t have to wear a tux unless you want to. And even shoes are optional when it comes to beach weddings. These fabrics can help keep you cool on your special day. And they’re appropriate to wear to a beach location. You may want to run this by your partner first before you wait at the aisle. While wearing a nice pair of jeans may be a hip statement at your wedding, she may not think so. So make sure you get the green light first. In addition, you may want to personalize your groom attire with some hip accessories. Bow ties are very trendy. You can get them in a variety of colors to match your wedding colors. And a bow tie can dress up your khakis and button-down outfit. Also, hats are not off-limits when it comes to a beach wedding. Try a summery woven hat in light colors to keep the heat off your head and make a cool fashion statement. You can also go regional with your accessories. If your wedding is in Hawaii, why not wear a maile lei? Or maybe a Panama hat if you plan on being in the sweltering Riviera Maya sun? Also, you can give your trousers or jeans a hip new look by pairing them with suspenders instead of a traditional belt. Vintage-inspired suspenders are a great look when paired with rolled-up sleeves and no jacket. If wearing a suit is an absolute “must” for you, there are a few options. For example, you can wear lighter shades to keep you cool, such as cream or light grey. These color choices are especially appropriate if you plan on having your ceremony during the day. 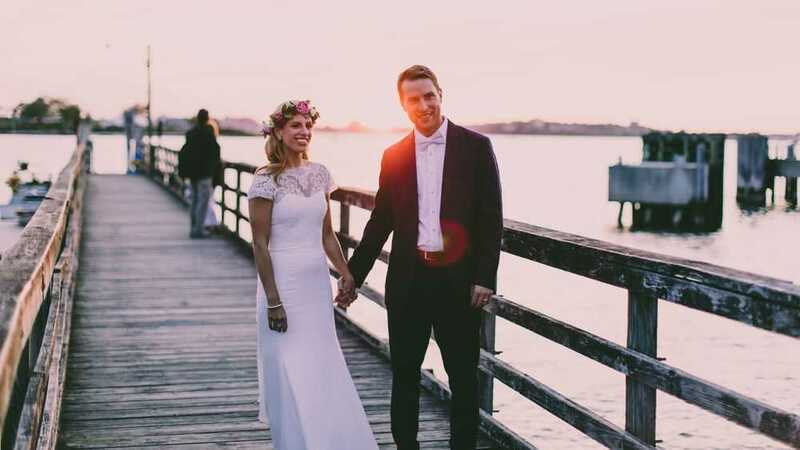 Try online clothiers like Island Importer to find the right suit to fit your special day. They specialize in linen jackets, pants, shirts, and vests for a classy beach wedding theme. Some beach locations may not be as hot as others. If you don’t have to worry about sweltering temperatures, you may also want to consider a navy blue suit. You can dress up or down a navy blue suit as needed. 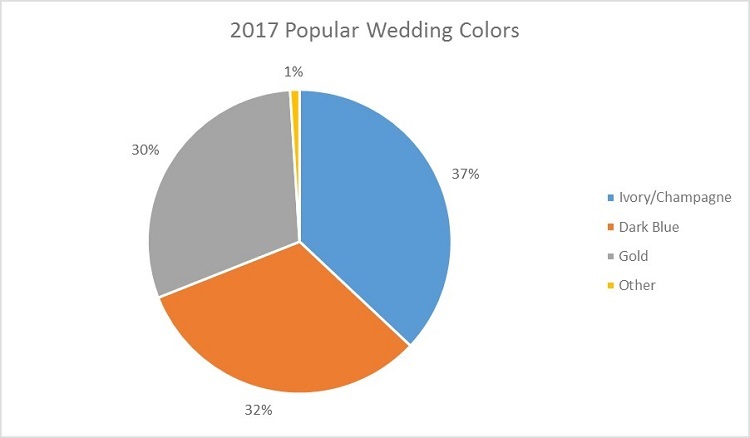 And it remains one of the top trending wedding colors. A navy blue suit is also a good choice if you plan on having your nuptials after the sun sets because it can be elegant without being overdressed. As an added bonus, this suit has wear-ability after the wedding. So, not only is it an elegant choice in groom’s wear, but you can use it for other special occasions too. Ready to check out this look? You can take a look at this slim-fit navy blue suit by Perry Ellis on Amazon. Or try a local clothier like Macy’s or an H & M store. Just remember to keep with the beach theme even in a suit. Consider leaving the tie at home and unbuttoning the top button of your shirt. Or just wear a vest and leave the suit jacket behind. 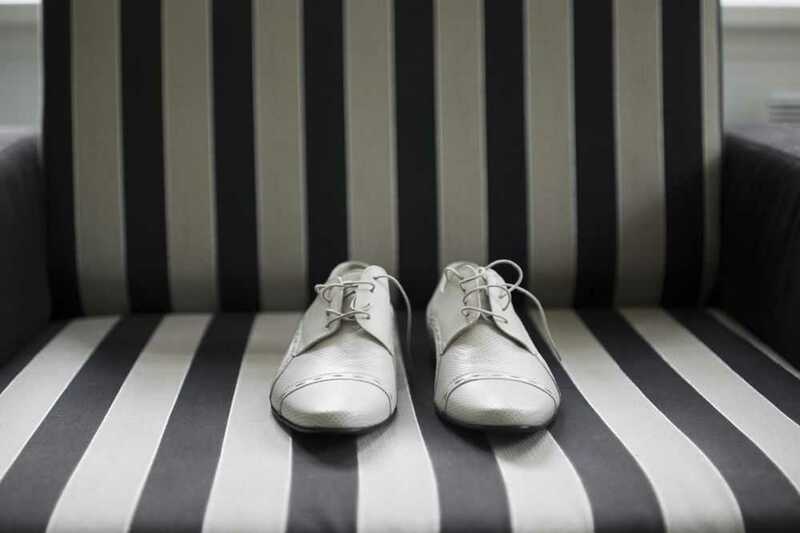 Are your shoe choices a big deal when selecting your groom attire? It can be when it comes to a beach wedding. Because the most obvious worry would be sand in your shoes, right? Well, one of the joys of having your wedding on the beach is the freedom to go barefoot. That’s right. Most grooms and groomsmen opt to roll up their pant bottoms and go barefoot to their ceremony. For beach weddings, keep your formal shoes at home. Not only will you destroy those expensive shoes, but you may also be miserable to boot. Instead, try for open-weave casual loafers or moccasins. Some fashionistas may gasp at the idea of wearing slippers to your wedding, but there is one caveat to this: they have to be dressy. Dressy slippers do exist. Think along the lines of pairing leather flip flops with your groom ensemble. And keep those foam and nylon ones for vacations instead. Beach weddings may lend itself to a casual look, but you can mix and match pieces to give just the right amount of dressy to your special occasion. For example, you can add a button-down shirt and vest sans tie to a nice pair of jeans for a look that’s dressy casual. Or you can go with regional clothing like the traditional Mexican guayabera shirt if you plan on getting married along the Yucatan peninsula. You also don’t have to wear a button-down shirt at all. Instead, choose a linen tunic-style shirt and pair it with linen pants for a look that’s relaxed and flowy in the coastal breeze. Are there things you should strike off your consideration list? A few. But these rules are subjective. Everyone knows that beach weddings are casual, but there are some things you should still avoid wearing. You may be tempted to wear a short-sleeved shirt to combat the heat. Don’t give into the temptation. Even a button-down short sleeve shirt is too casual for a wedding. If you get hot, you can always roll your sleeves up. It still looks a lot classier than wearing a short-sleeved shirt. Shorts are a no-no at a wedding, either as a guest or a groom. The only way you can break this rule is if both you and your partner agree to an ultra-casual wedding theme. Otherwise, save those shorts for another time. Also, pairing a pair of shorts with a suit jacket does not “dress-up” the outfit. You may end up looking unbalanced instead. Furthermore, unless you plan to make it a theme and all of your groomsmen dress in shorts with jackets as well, you may stand out for the wrong reasons. It’s sunny and hot on the beach. Can you wear your sunglasses? The answer is yes. But only to and from the ceremony and reception area. Once you get to your appointed place, though, those shades need to come off. This is a special occasion, and wearing your sunglasses all through the ceremony may be a little tacky. If the sun is going to be an issue, consider wearing a hat or putting up a shade over the place you plan on taking your vows. Furthermore, it’s acceptable to wear your sunglasses in your wedding pictures – if your spouse approves. Some wedding shots are quirky with the entire wedding party decked out in their shades. Otherwise, let the world see the love in your eyes and don’t cover them up. You may think this is opposite to what was said earlier. But there’s one special rule to this: if you wear a suit with a jacket, avoid the sandals. It looks strange. Even for a beach wedding. Instead, if you want to wear a suit, you can keep the sand out of your shoes by taking them off completely. Roll up those pant legs and go barefoot. Believe it or not, it actually looks better doing this than wearing sandals the entire time. Does this include flip flops, too? Yes, and no. 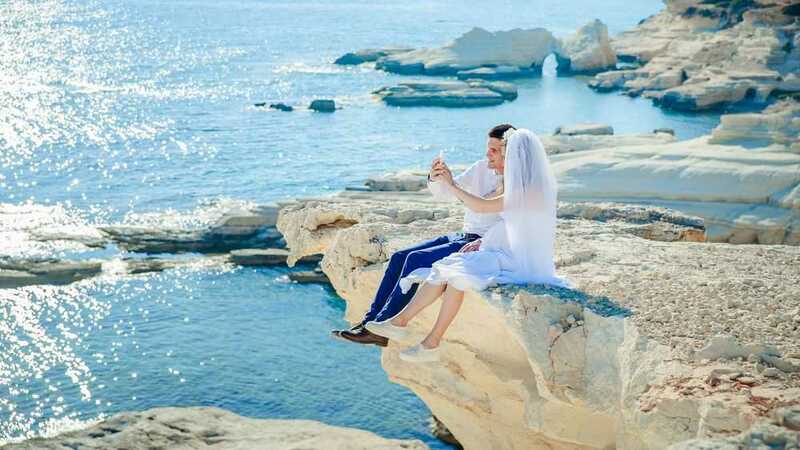 Ideally, you won’t wear a jacket for your beach wedding. So the button-down shirt and trousers in a light fabric are okay with dressy sandals. But if you plan on going the whole 9 yards with a suit and tie, it’s better to skip the sandals and flip-flops altogether. Beach wedding grooms may also want to avoid black accessories. There are different reasons for this including it clashing with your light-colored clothing. It may also draw sun and heat to you in strange places. And black accessories can be too dressy for the environment. Instead, go with light neutrals like tan, cream, or khaki. You can have bold shots of colors in your accessories. Or incorporate ice cream-like pastels if they coordinate with your wedding. But try to avoid that black leather belt or black handkerchief. 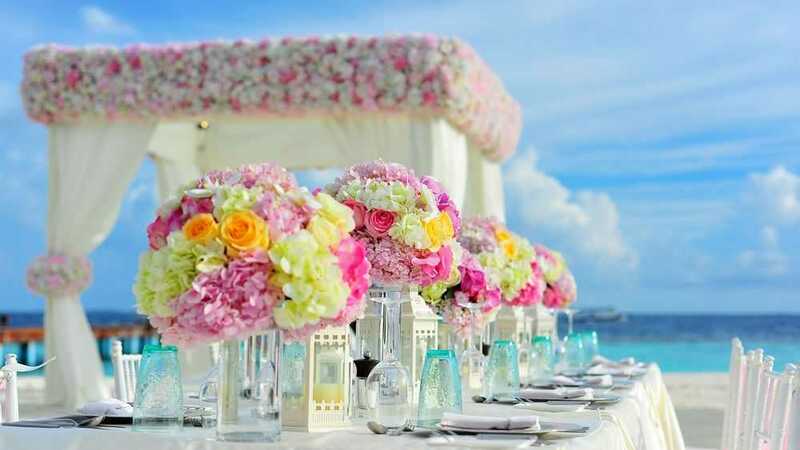 Beach weddings give you the freedom to be as whimsical and casual as you want to be. But you and your spouse-to-be have to agree on it first. Clashing your wedding attire is no way to start off your life together. 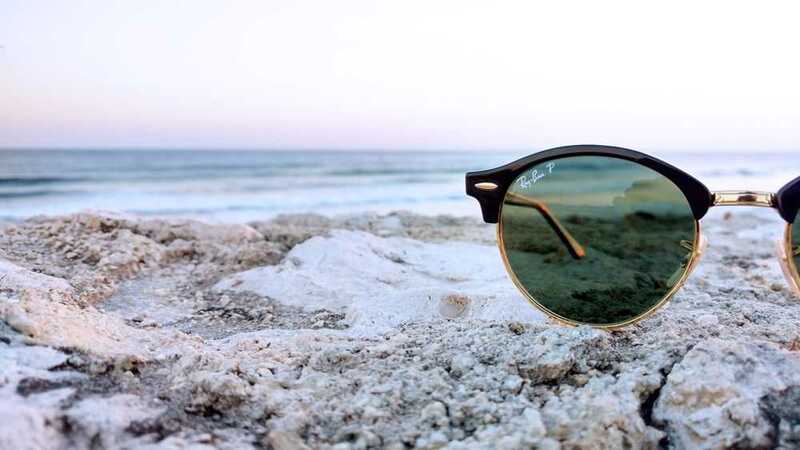 Furthermore, there are plenty of ways to look classy and stay cool on the beach. No one expects you to be in a black tuxedo. But keeping it semi-elegant may set a positive tone for your wedding. And it lets her know you still want to look your best, even on the sand. Lastly, these are less like rules and more like suggestions. So feel free to disregard ones that don’t work for you. Your wedding should be as unique and personal as your love for your partner. And if Bermuda shorts and blazers are your thing? Let the good times roll.